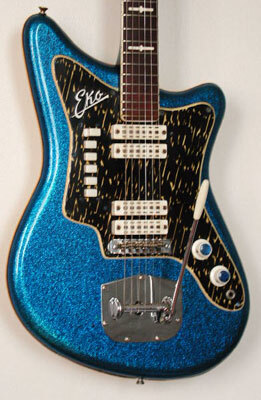 THIS IS THE ARCHETYPAL EKO GUITAR, THE ONE EVERYONE KNOWS, EASILY IDENTIFIED BY ITS BODY DESIGN OBVIOUSLY INSPIRED FROM THE FENDER JAZZMASTER AND ITS SPARKLE CELLULOID (“PYROXYLIN” SAID THE CATALOGUE) FINISHES. 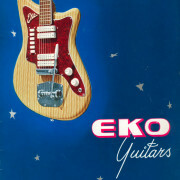 Available with one to four pickups (500-1, 500-2, 500-3, 500-4), with a vibrato (symbolized by suffix ‘V’) or without, the 500 was a mainstay of the Eko range from early 1962 through 1965 and was distributed in virtually every country of the planet, backed by a worldwide promotional campaign. 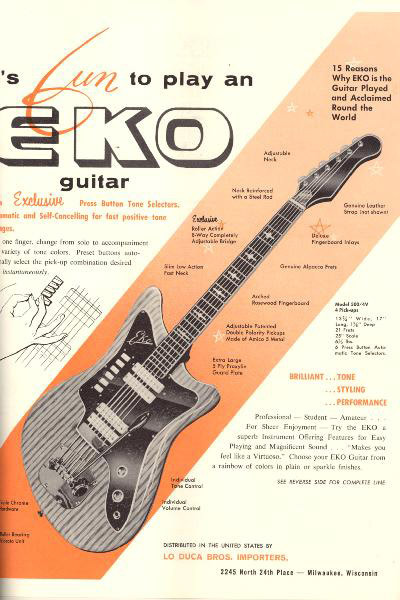 Small stores like there were many back then, liberally mixing TV, radio, records, possibly house appliances too, often had one or two Eko 500 in display. They were irresistible eye-catchers in the shop windows. 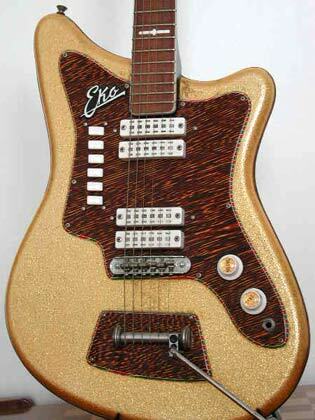 Since those retailers were generally just as clueless about setting up a guitar as the newbies who were their customers, and as factory setup was often a bit hasty, old Eko sparkle guitars have retained a questionable repute: “All for the look, nothing for the sound”. 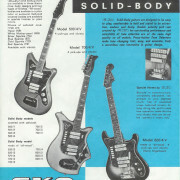 Let us face it, Eko solidbody electrics of the pre-1965 era all have some shortcomings as far as sound and ergonomics are concerned. 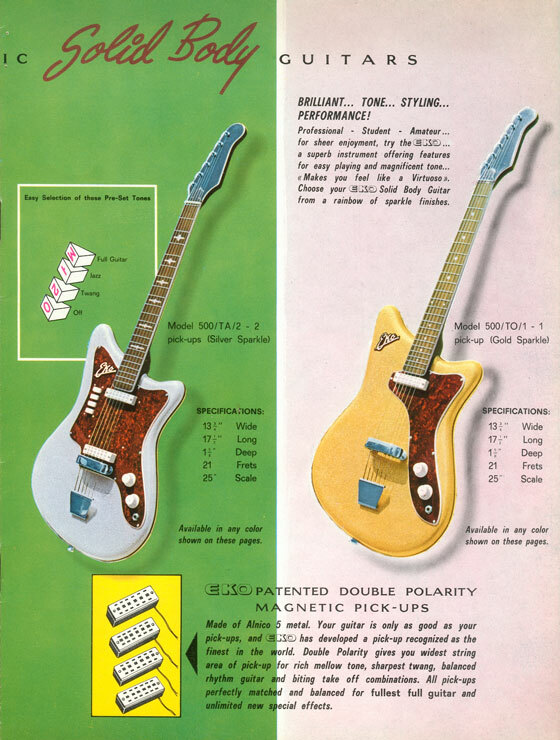 The so-called ‘Double Polarity’ pickups are low output. The crazy intricacy of the circuitry is no warrant to its reliability. 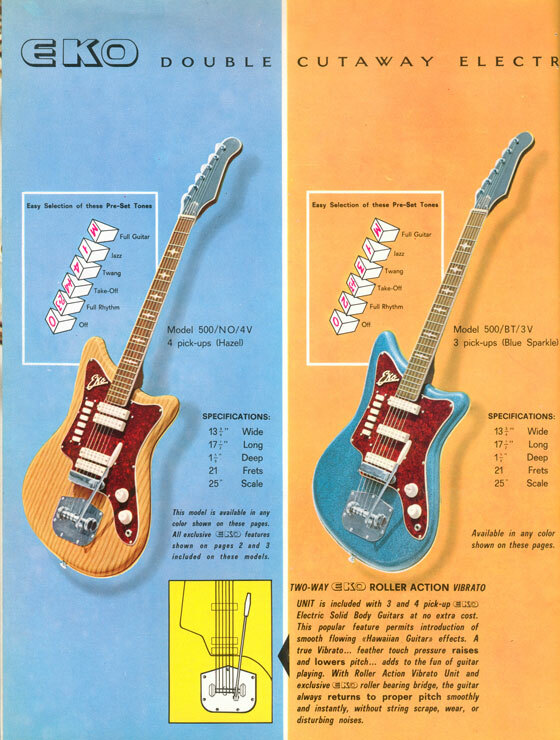 Some of the tones offered by the slide-switch selector are of little to no use. In my opinion the bridge deserves the sharpest gripe. 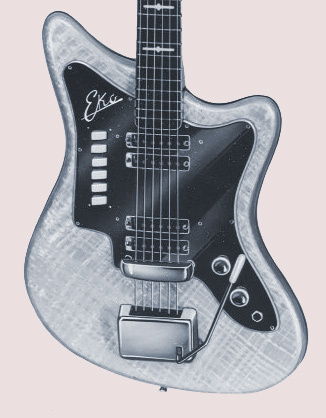 Not only is it inspired from the Jazzmaster with its infamous rattling saddles but it tends to rest where it should not, upon the plastic scratchplate. This bridge is an accomplished sustain killer when the problem is not cured (fortunately it can be). 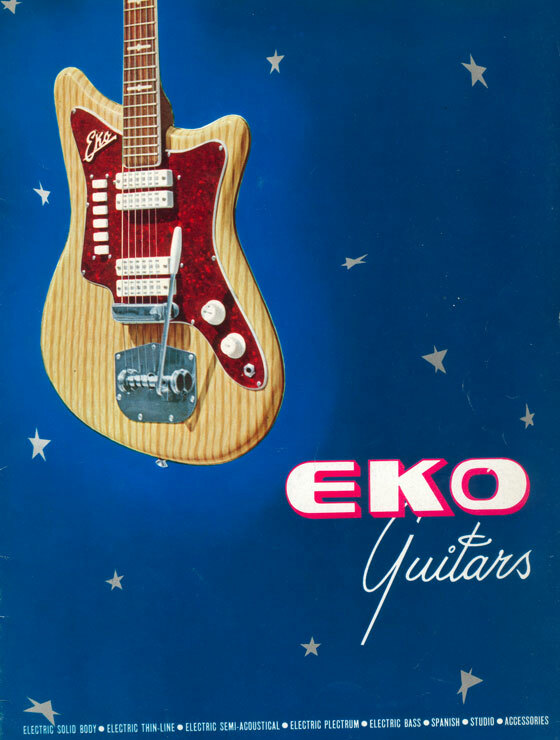 With an adequate setup and a little TLC an Eko 500 can still be made an instrument that stays in tune, sounds quite good with a decent sustain and plays real good thanks to its smooth and thin neck. 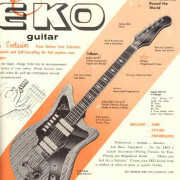 This neck continues the headstock shape and the propeller inlays of the 400 series but aside from that is totally different: much thinner oval profile (quite similar to contemporary Fender necks), bolted-on and not glued-in construction, standard fret wire instead of jumbo frets, and longer scale length. 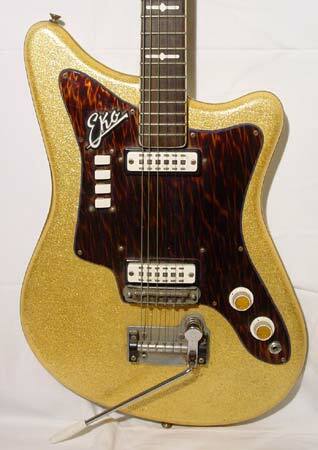 The very first generation from early 1962 is quite rare. 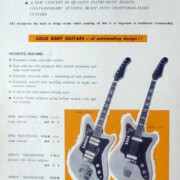 Interestingly the few specimens we have been informed of are equally distributed between Europe and North America, which suggests that LoDuca began selling some 500’s in USA earlier than generally alleged, or that those guitars were marketed through other distributors (the unknown ones who imported the 400 series to the U.S.). 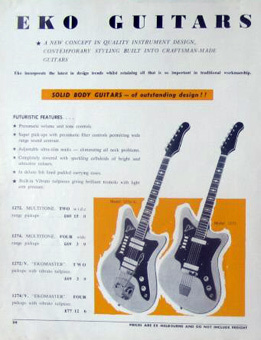 Production was discontinued in the course of 1965. 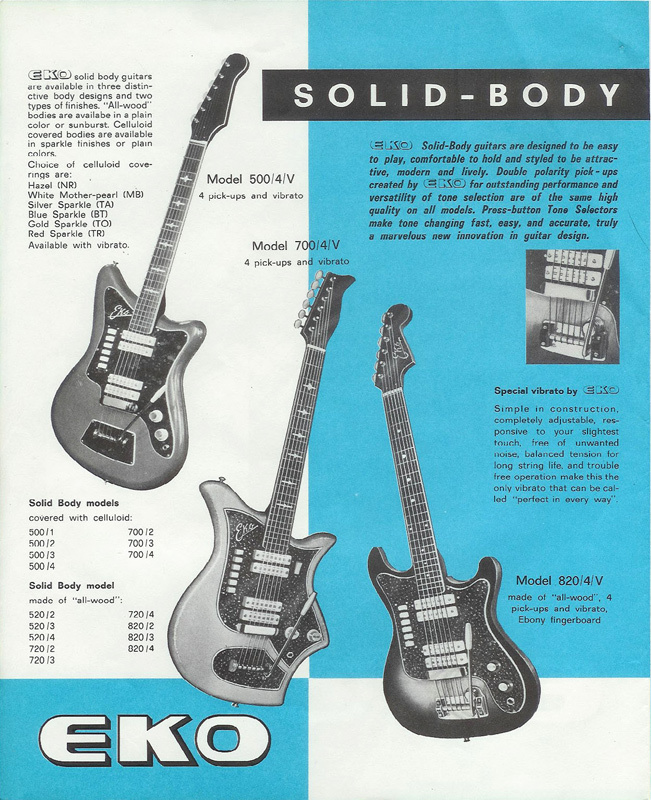 There are some extremely rare late models featuring a neck with dots instead of propeller inlays and a natural finish on the back, or even a 820/Condor neck. About equally prevalent on the vintage market are the three main generations of 1962, 1963 and 1964, the earliest one being a little less common due to its shorter production life. There are remarkably almost no transition types between those main types. 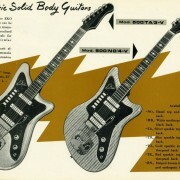 ECCO LA EKO ARCHETIPALE, LA PIÙ CONOSCIUTA, FACILMENTE IDENTIFICABILE GRAZIE AL CORPO EVIDENTEMENTE ISPIRATO ALLE FORME DELLA FENDER JAZZMASTER E LE SUE SCINTILLANTI RIFINITURE DI CELLULOIDE (“PIROSSILINA” COME RIPORTAVA IL CATALOGO). 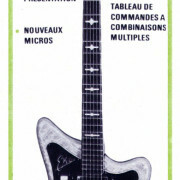 Proposta con tutte le configurazioni di pick-up da 1 a 4 (500-1, 500-2, 500-3, 500-4), con il vibrato (segnalato dal suffisso ‘V’) o senza, la 500 fu il cavallo di battaglia della Eko dall’inizio del 1962 fino al 1965 e venne commercializzata in quasi tutti i paesi del pianeta, spinta da una campagna promozionale di ampiezza mondiale. Anche i piccoli negozi numerosi in quel periodo, offrendo liberalmente TV, radio, dischi ed eventualmente elettrodomestici, avevano spesso una o due Eko 500 in offerta. Facevano della vetrina un’attrazione irrresistibile. 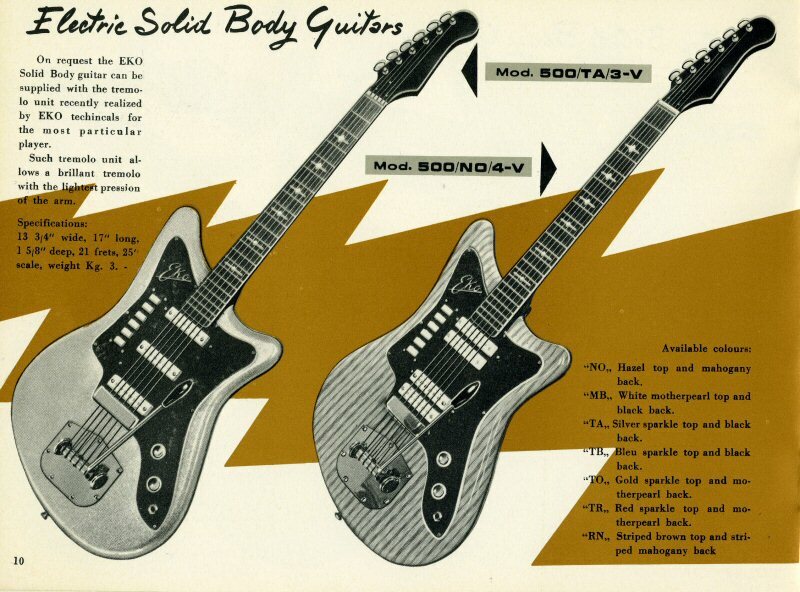 Dato che in questi negozi si ignorava come settare una chitarra e che i principianti loro clienti ne sapevano un bel nulla, e visto anche il set-up di fabbrica spesso un po’ frettoloso, le vecchie Eko conservano ancora la ingenerosa fama “tutta apparenza, niente suono”. Ammettiamolo, le Eko elettriche anteriori al 1965 hanno tutte certe deficenze in termini di suono e di ergonomia. I pickups cosiddetti a ‘Doppia Polarità’ hanno una uscita poco elevata. La complicazione pazzesca dell’elettronica non è un fattore di affidabilità. Certi timbri offerti dal deviatore a pulsanti sono scarsamente utilizzabili. Secondo me i problemi più grandi sono dati dal ponte. 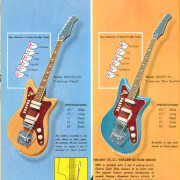 Non solo si è ispirato alla Jazzmaster con le sue sellette infauste ma tende ad appoggiarsi laddove non dovrebbe, sulla plastica del battipenna. Questo ponte è un perfetto ammazza-sustain se non si rimedia al problema (che per fortuna si può curare). Con un set-up adeguato e un pò di attenzione si può fare di una Eko 500 uno strumento che non si scorda, con un sustain decente e che si suona benissimo grazie al suo manico svelto e scorrevole. 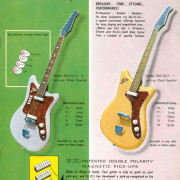 Quest’ultimo riprende la paletta e gli intarsi a UFO della serie 400 ma per il resto è totalmente diverso: sezione ovale ben più sottile (assai simile alle Fender dell’epoca), costruzione avvitata invece che incollata, tasti standard e non più jumbo, e scala più lunga. La primissima generazione dei primi mesi del 1962 è piuttosto rara. La distribuzione è ripartita egualmente tra Europa e Usa per i dati che abbiamo e lascia pensare che LoDuca abbia distribuito questo modello prima di quanto si pensi o che lo facevano i primi distributori che importavano anche la serie 400.